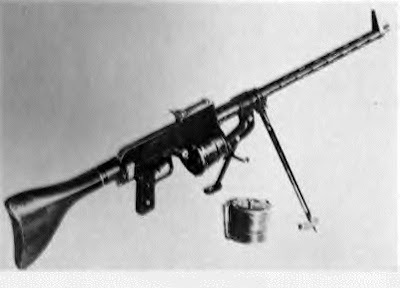 The Volksmaschinengewehr VMG-27 (German "People's Machine Gun 27") is an incorrect interpretation of the term 'VMG 27'. At the end of WW 2 several weapons were developed which would be easy to produce in large quantities. These were very simple, even crude designs which would be produced in local factories and to arm the new Volksgrenadiers and Volkssturm militia during the latter days of the Third Reich. In 1916 Heinrich Vollmer began working on a design of a light machine gun. The design took time, resulted in a limited amount of prototypes but none reached a full development stage. At the end the weapon was known as a MG Vollmer, later also as VMG 1927. It consisted of only 78 parts while the standard MG of those days, the MG 08/15 consisted of 383 parts. It was recoil operated and fed from a small drum magazine underneath the receiver. In 1927 Vollmer also obtained a patent covering the breech mechanism of the weapon. Even later on, Vollmer offered his design in cooperation with Mauser Werke as a MV 31 (MauserVollmer 1931) to German ordnance board - Inspektion für Waffen und Gerät - IWG. This machine gun was of a quite simple design, it had a quickly changeable barrel, drum magazine and German armed forces tested it quite thoroughly. The MV 31 was not a bad weapon at all but at the end failed to be adopted. This was possibly because it was a light MG incapable of being used as a heavy one. For such a multifunctional weapon the German armed forces had to wait until the arrival of the legendary MG 34.